February is the shortest month of the year but that doesn’t mean there is any less happening. Tuscan Bistro Bar, a favorite Toms River restaurant, has great offerings and events for February. Super Bowl Sunday is the biggest day of the year for football fans, especially if your favorite team is one of the contenders. This year is the 50th anniversary of the Super Bowl and for almost as many years, fans have gathered with friends, family and great food for the event. You don’t want to miss a single minute of the game and then there is the half time show and the commercials! Everyone will be talking about it the next day, so you won’t want to spend any time in the kitchen during the game. 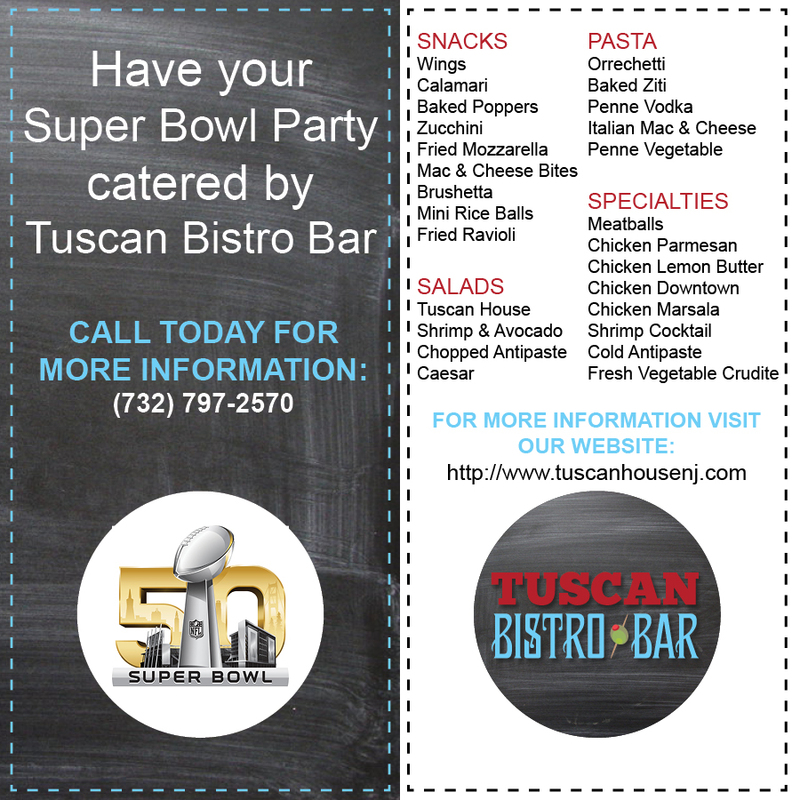 Tuscan Bistro Bar is offering a great selection of game time favorites to celebrate this milestone in Super Bowl history. Let us cater your Super Bowl Party and sit back, relax and enjoy the big game! Of course the biggest day of February Is Valentine’s Day. In addition to the traditional candy and flowers, a romantic dinner is another common way of celebrating this holiday. 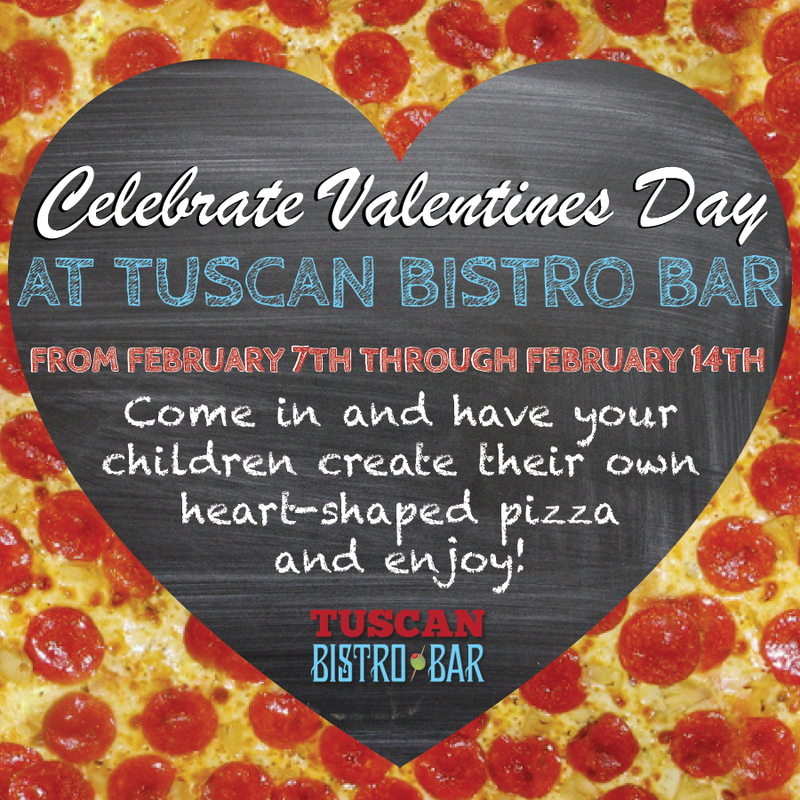 Tuscan Bistro Bar makes it anything but common with Chef’s Specials and Heart Shaped Pizza. A special selection of delicious entrees, the Chef’s Specials are the perfect way to enjoy dinner with your sweetheart. If you and your Valentine are pizza lovers, together you can create your very own heart shaped pizza. This is also a great way for the kids to help Mom and Dad celebrate Valentine’s Day. They are sure to enjoy and take great pride in helping to prepare this Valentine’s Day feast. Tuscan Bistro Bar knows that into day’s busy work, not everyone will be able to celebrate by dining out on February 14th and we don’t want anyone to miss out. The Chef’s Specials are being offered from February 12th through February 15th and you can make that Heart Shaped Pizza from February 7th through February 14th. Mom and Dad, you could make pizza with the kids one evening and have a romantic dinner alone on another evening. With the popularity of the holiday and Tuscan House Bistro, we strongly suggest reservations for Valentine’s Day. Don’t disappoint your sweetheart, make your reservations today! 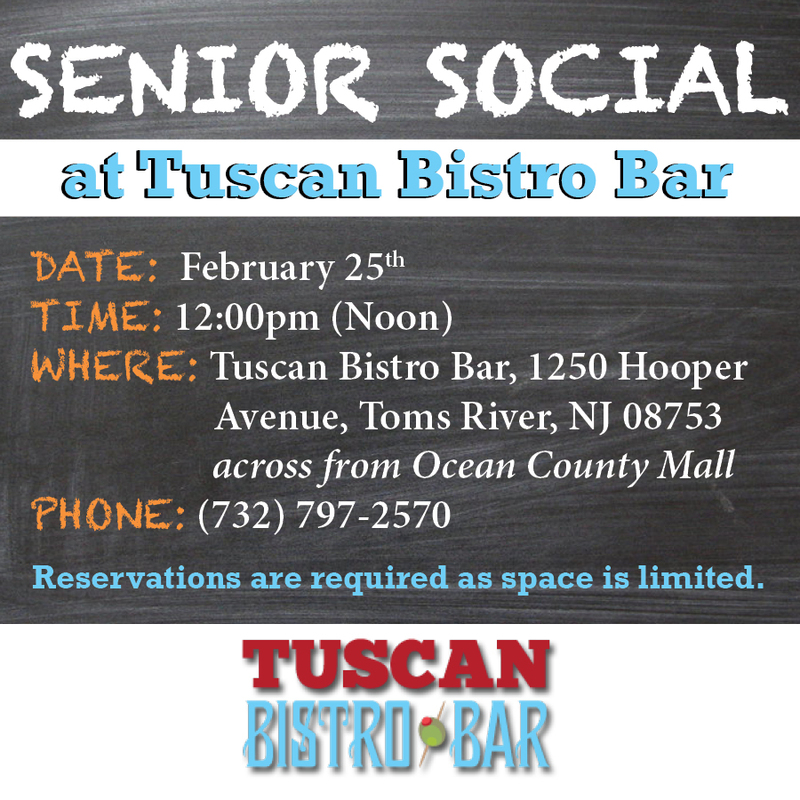 On February 25th Tuscan Bistro Bar will be hosting a Senior Social. Beginning at 12:00 noon, a delectable buffet luncheon will be served but the highlight of this Social is the guest speaker. Joanne Padrone of Ocean County will be joining us to share information about the many senior programs the college offers. She will also be talking about events taking place at the Grunin Center. This social will be a wonderful opportunity to get out, meet new people as well as old friends and enjoying some good food while learning about upcoming events and programs available in the community. Reservations are required for the Senior Social as space is limited. Not only will this be an enjoyable and informative afternoon, it’s also a bargain at just $12.00 including tax and gratuity! At Tuscan Bistro Bar you’ll find authentic Italian dishes, American fare favorites, and a full bar at the Tuscan House! Come in and try our wood-burning oven rustic pizzas, homemade pastas, juicy burgers, our popular homemade desserts, and our new tasty pub menu all at family friendly prices. Tuscan Bistro Bar, a popular, Toms River restaurant, also offers catering and private parties, as well as hosting special events. Call today to see how we can make you special event perfect!